Tuesday 7 October 2014 - Will we ever see The Silmarillion on the big screen? As we all know J.R.R. Tolkien is best known for his The Lord of the Rings, but his work is far more immense and so multilayered that the average reader or viewer tends to easily miss his point. 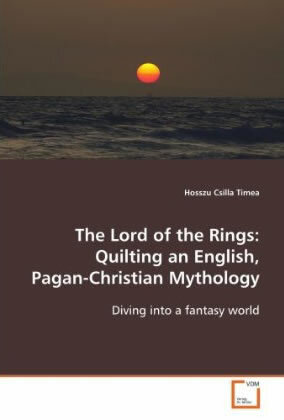 In the book The Lord of the Rings: Quilting an English, Pagan-Christian Mythology, the author Hosszu Csilla Timea tries to open up and clarify certain things and thus bring Tolkien's world closer to present and would-be readers. This book has been released by VDM Verlag, who in the past released several other Tolkien titles, like for example Projecting Tolkien's Musical Worlds - A Study of Musical Affect in Howard Shore's Soundtrack to Lord of the Rings by Matthew Young and Roots of Middle-Earth Seeds of Fantasy by Krisztina Sebok and recently described Cinematic Scripture: The Structure and Usage of The Lord of the Rings as Equipment for Living. For one or another reason I only discovered this small book (only 76 pages) a month ago and now found some time to put up a small article about it. Having ordered it I hope real soon to be able to read the book, since it sounds very inviting to read (and probably contact the author to answer some questions about it!). This book is addressed to people who know and like Tolkien and to those who do not know him but are still willing to experiment with a world full of fairies, ents, dwarves and hobbits. In The Lord of the Rings: Quilting an English, Pagan-Christian Mythology there are many controversial topics, debatable statements and strange interpretations, all made by the author who invites all readers to discuss them with her. As for discussing, I managed to find a facebook account that belongs to Hosszu Csilla Timea, but as for now I was not accepted as a 'friend' - so far the discussion of some of the topics. As for now we will have to do it with the description of the book by the author: "This work is representing my views on the thing that is called Tolkien's imaginary universe. Although it is far from complete, I intend it to be a digestable starting point towards other, more elevated and valuable works on the same author. The present work is the result of a long process of diving into a universe that could easily pass for an authentic, well established and functioning mythology. What Tolkien intended was to create this world and I intended to bring it closer to anyone that makes the effort to try it". Quilt (kwilt) n. - A coverlet or blanket made of two layers of fabric with a layer of cotton, wool, feathers, or down in between, all stitched firmly together, usually in a decorative crisscross design. Quilt·ing (kwil'ting) v. - To stitch together (two pieces of cloth and a soft interlining), usually in an ornamental pattern. Well, I must say that this is a very nice way of presenting the creative process of building Tolkien's mythology! Enjoyed this post? Click to get future articles delivered by email or get the RSS feed.